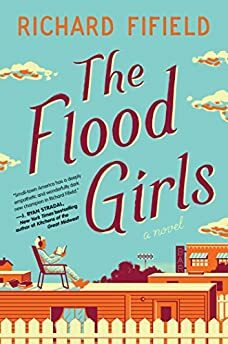 Largehearted Boy: Book Notes - Richard Fifield "The Flood Girls"
Book Notes - Richard Fifield "The Flood Girls"
Richard Fifield's debut novel The Flood Girls is a remarkably poignant and funny observance of small town life. "Fifield's debut is an exaggerated, no-holds-barred portrait of a small town that doesn't easily forget or forgive, and it turns alternately laugh-out-loud funny and sadly all-too-true." Every single thing that I write is informed by music. I cannot write in silence—I'm not that kind of novelist. Universe building is my favorite part of the process; I'm allowed to be indulgent (and super gay) as I curate the fashion, pop culture influences, and most importantly, the music for each character. (Yes, I was Pinteresting before Pinterest was a thing.) Creating playlists for Jake, Rachel and Laverna gave depth to the writing of The Flood Girls, and assisted in building a distinct point of view for each of my main characters. The novel takes place in 1991, and hangs on a bar in Montana called The Dirty Shame—the jukebox is mentioned throughout, and I stocked it with a playlist for Laverna, the proprietor. She is a very difficult woman, and I imagined her imperiously micromanaging the contents of the Wurlitzer Zodiac. Laverna is a character that has been burned one too many times, and her jukebox reflects this: Dottie West—"A Lesson In Leavin'"/Tina Turner—"Better Be Good To Me"/Glen Campbell—"Gentle On My Mind"/Waylon Jennings—"Storms Never Last"/Tammy Wynette-"'Til I Get It Right"/Don Williams—"Some Broken Hearts Never Mend"/The Judds—"Why Not Me"/Juice Newton—"Love's Been A Little Bit Hard On Me"/Dolly Parton—"Here You Come Again"/Merle Haggard—"Mama Tried"/Townes Van Zandt—"Loretta"/Charly McClain—"Paradise Tonight"/Sylvia—"Nobody." Two entire albums made the cut: Ray Charles' Modern Sounds In Country & Western Music and Lyle Lovett's Pontiac were in constant rotation. Jake is twelve years old, and a misfit. His boombox is the classic Emerson Ghettoblaster Double Cassette—it was a delicious task to google the stereos of my youth! While writing Jake, I clung to the albums that informed my own adolescence. It has been suggested that Jake is my autobiographical character, but trust me, I was never that fabulous. Jake is in a tumultuous relationship with the Columbia House Record Club, and here are the twelve cassettes he got for a dollar: Madonna—Like A Prayer/Depeche Mode—Violator/Concrete Blonde—Bloodletting/World Party—Goodbye Jumbo/The Smiths—Louder Than Bombs/Pretty In Pink—Original Motion Picture Soundtrack/Janet Jackson—Rhythm Nation 1814/George Michael—Faith/The Cure—Disintegration/The Sundays—Reading, Writing And Arithmetic/Sinead O'Connor—I Do Not Want What I Haven't Got/INXS—Kick. All of these albums were “outsider” music for a small town in Montana, circa 1991. I can tell you from personal experience that the soundtrack at the time was hair metal and Garth Brooks. Rachel was the hardest character to write. Musically, I imagined her listening to cassettes in her beloved red truck, the stereo a stolen Pioneer, installed by an ex-boyfriend. The sound quality is tinny, the equalizer turned low because the speakers have blown. Because Rachel's journey is so insular, I had to seek inspiration from an artist that was not recording in 1991. Patty Griffin's music is timeless, her songwriting a perfect distillation of devastating longing and reckless faith. Rachel is always, always searching. During one hot summer, I locked down the character of Rachel by listening to these Griffin albums on repeat: American Kid, Living With Ghosts, Flaming Red, Children Running Through, Impossible Dream, 1000 Kisses. Some songs were especially helpful in going deep: "Mad Mission," "When It Don't Come Easy", "Chief," "Go Wherever You Wanna Go," "Long Ride Home," "One Big Love," "No Bad News," "Tony," "Sweet Lorraine," "Rain," and "You Never Get What You Want." I thank David for the chance to play DJ for a few minutes. If you ever invite me to a cocktail party, I will be the bad gay in the corner who hijacks your stereo, demanding that everybody be quiet to listen to a particular song. Yep, I'm that guy. Thank you!